All those tales of groping and "rowdy Hollywood parties" couldn't stop Arnold's inexorable march to the governorship. Secret salaries for promoting over-the-counter steroids in muscle magazines haven't brought him down. Even his oft-quoted admiration of Hitler was a non-issue. 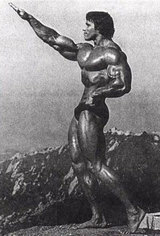 But Arnold Schwarzenegger's opponents have overlooked the most embarrasing episode in Arnold's pre-political carreer - the exercise record he recorded in 2000, Arnold Schwarzenegger's Total Body Workout. Yes, more damaging than appearing pregnant in the movie Junior, more humiliating than the box office performance of Kindergarten Cop, Arnold's Total Body Workout record has him doing 12, 24, 36 reps of calf raises to It's Raining Men (MP3)! Think about it. Calf raises to It's Raining Men. It could achieve what groping affidavits, over the counter steroids and Rob Reiner can only dream of. is that the way it is, or the desperate interpretation of a man you don't like because of his party affiliation. the quote is from the OH SO reputable source of - an unpublished book proposal! a proposal whose author stated that they were taken out of context. none of this matters to you of course. its a niftly little nugget to bolster a paranoid view of "the evil party". "I cannot remember any of these. All I can tell you is that I despise everything Hitler stood for. I despise everything the Nazis stood for ... everything the Third Reich stood for." and he has always given immensley to the simon weisenthal center. whats next another obsequious post lauding the reptilian drunk George Galloway? he was just on Al Jazeera paying homage to the brave insurgency! is this for real? just seems like this could be a spoof. Can you buy it anywhere? Thank you, Horns. There's nothing more fulfilling than getting into a pointless political argument with someone who refuses to even identify his bad self. Thanks for pointing out that Arnold denied being an admirer of Hitler. I was not aware of that. What a surprise! Given Arnold's desire for a political career, I would've expected his response to be more along the lines of: "Yes, I admired Hitler then, and I admire him even more now!" But you are absolutely correct that WFMU's blog really has a moral responsibility to display even-handedness with regard to our coverage of the exercise record issue. So I will endeavor to find an embarrassing workout record from a well known democrat and post it here. Barbara on KPFA in Berkeley, CA often used to start her Crack O'Dawn show with this. Made me laugh, what with him being Govnah and all. This post is teh new hotness. Thanks. If you forget about politics, rumours and film preferences for a moment: He has artistic value. The imagery that is. And sad but true: Politics is more like a beauty contest then a contest of ideas for some. my god. how could this have slipped under my radar?! sure it's a hilariously ridiculous novelty, but this thing totally friggin' rocks! thank you sooooo much! i've been looking everywhere for this "CD". there's nothing like listening to arnold over journey! "Up, down... beginners should only do 50!" priceless. oh, and as per the politcal orientated comment by hornsofthedevil... ok, let's say the hitler thing was made up. how do you feel about the groping of women that he [arnold] admitted to? or is that some biased agenda too? democrat or republican... doesn't matter. the man is slimy. and this album is funny. Yes, "hornsofthedevil", he did publicly state that he admired Hitler. But of course, consider the context... blah blah. We all know that anything we say can be taken to mean the opposite (ask anyone who's argued with his wife) and once someone has achieved any level of public notoriety there will be someone out there to do the word-twisting for you. But don't just dismiss the source and accept his new statement as making it all better-- that would be convenient, but still lying. Although come to think of it, lying would about the only thing consistent with Schwarzenegger's historical revisionism. Dear ANOLD SCHWARZENEGGER brother,I am Rana.Age 21.I have an unique dream.Taht is"I will be an Actor in Hollywood movi".It is only one dream of my life.When I say it to my friends,then they are too much insulted to me.All of my friends said-it is 'absurd'.But my father said, "You will be a world famous Hollywood Actor".Today is my father's 6th death annivesary.I feel very sad and so unhappy now because of my father and my dream.I was apply DV lottery previous years(Dv-2007,Dv-2008).But I am unlucky.At last I apply DV lottery-2009 and I am so optimistic that, I will be a winner of DV lottery-2009.All kinds of effort only for my unique dream.If my dream will not come true then I will must suicide.Dear ANOLD brother,I am so upset now.Please show me a real way and give me a sensible advice. I am so eagerly waiting for your positive reply.